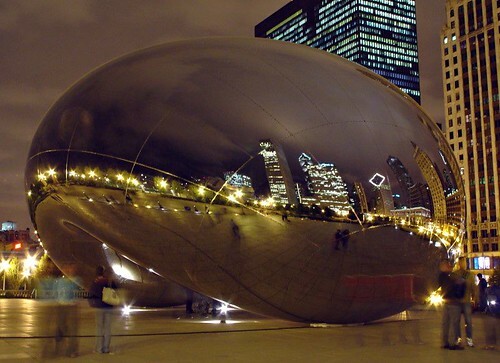 This fantastic looking sculpture, largest of its type in the World and known as "The Cloud Gate" is the centrepiece of the Millennium Park at Chicago. 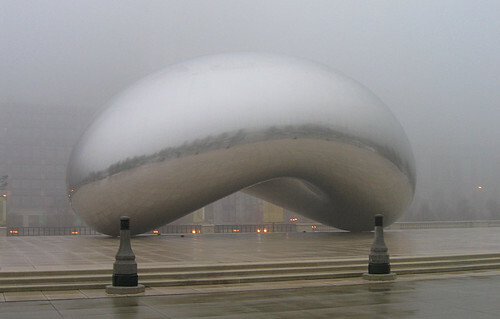 It is nicknamed as "The Bean" because of its legume-like shape. 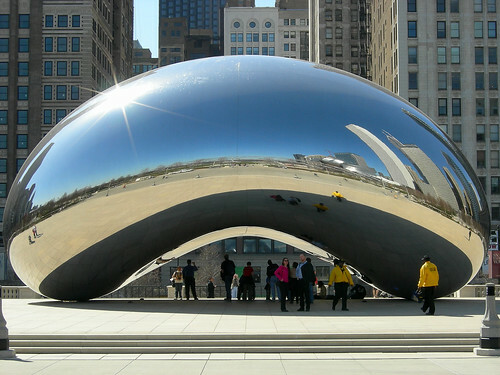 Designed by Indian-born British artist Anish Kapoor it is made up of 168 stainless steel plates welded together and then finely polished with the results that it has a highly reflective surface with no visible seams. 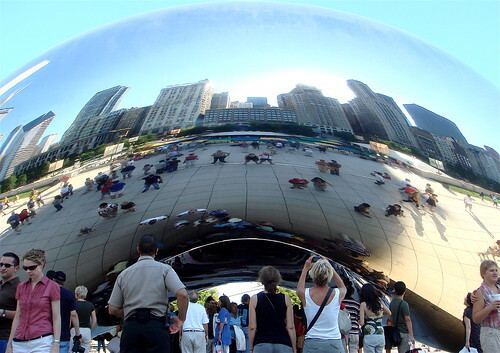 The design was inspired by liquid mercury and the sculpture's mirror like surface reflects overhead clouds and distorts the city's skyline. 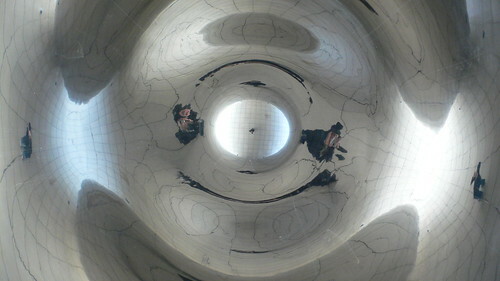 The polished underside acts like concave chamber that warps and multiplies the reflections of the objects/persons underneath. Weighing about 110 ton, it is 10 metres high, 20 metres long and 13 metres wide with bottom arch of 3.7 metres. 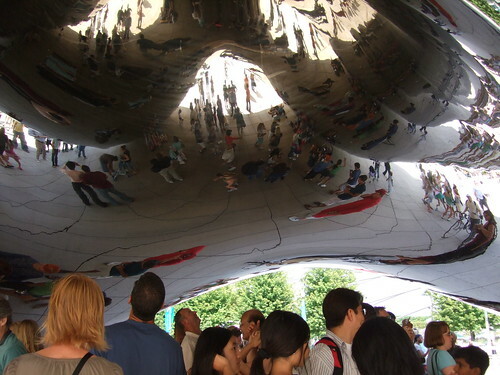 The Cloud Gate was formally dedicated on May 15, 2006 and like the nearby Crown Fountain is loved and enjoyed by all. Note the photographer's small figure in the centre and his distorted enlarged images on left, right, extreme left and extreme right. Here also the photographer is in the centre with several distorted images all over. Click on the Flickr link above to see the details. 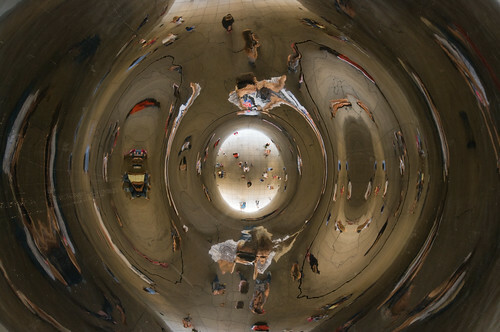 The Bean really needs to be seen to be believed. 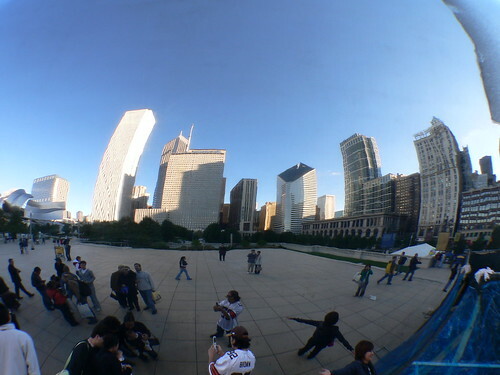 The reflections are amazing, and as can be seen from the pictures here, they change day by day and minute by minute. Definitely worth a visit.